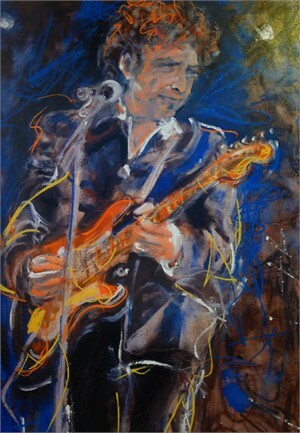 Artist Ronnie Wood. The Rolling Stones are on tour now. British artist and guitar player and Rolling Stone artist Ronnie Wood. We all know his work as singer, guitarist and songwriter with the Rolling Stones, Mick Jagger, Charlie Waits, Keith Richards and Rod Stewart and The Faces, but herein we witness his talent to visualize in art the stunning world of music that surrounds him. Ronnie has been painting and drawing since age 12, even longer than he has been playing guitar. As an ongoing part of Ronnie Wood's multi-career, he paints the musicians with whom he plays, documenting his world tours and recording sessions in vibrant action portraits. The most unique aspect of Ronnie's dual talents is that they not only run parallel, but are completely integrated in their expression. 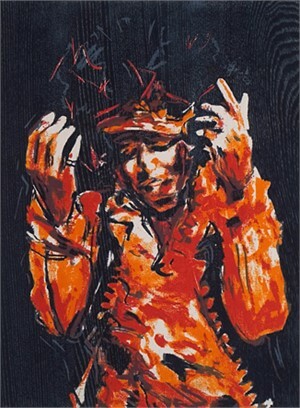 His Art flows with rhythm and melody while his music provokes color and imagery.